Bad Religion by Ross Douthat reviewed: Christian argument against homosexuality. It must be torture for an intelligent Christian to argue against homosexuality. Reading your defense of the teaching against homosexual relationships brings me pain. Maybe I’m having some kind of Christian spiritual experience. But it feels much simpler: I’m watching an intelligent, compassionate writer torture his intellect and his values to fit a dogma that can no longer be justified by anything outside itself. In the long run, I don’t think you or Christianity can withstand these contradictions. Fortunately, you’ve identified a way out: through an “intellectual or theological breakthrough,” “Christian moral doctrine could develop on this question without betraying the core of the faith.” Your book shows that this has happened before. Why is orthodoxy still around? In part, because it’s flexible. Unlike fundamentalism, orthodoxy is a driving brake, not a parking brake. It resists but also incorporates change. 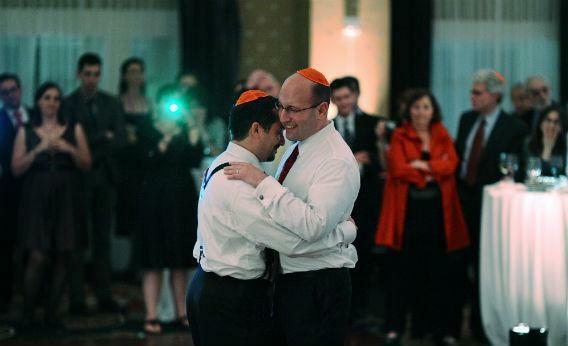 Yoni Bock, left, and Ron Kaplan share a dance at their wedding reception at the Hotel Monaco on November 10, 2011, in Washington, DC. Photograph by the Washington Post/Getty Images. The other example is civil rights. You point out that Christianity supplied the civil rights movement with a language of universal moral claims, and that black churches gave the movement its organizational power. You even tout Martin Luther King Jr., as a “neo-orthodox” figure. But you also admit that Southern clergymen opposed civil rights agitation, Pope Pius IX expressed solidarity with Jefferson Davis, and Billy Graham said only Christ’s return, not marches or politics, could end segregation. When I rearrange these facts and characterizations chronologically, it looks as though Christian orthodoxy assumed segregation and then, confronted by the moral and political tidal wave of civil rights, revised its doctrines to embrace the new order and its heroes. I look forward to the day when Christian writers explain how they found, in their faith’s past, the resources to see more clearly God’s intentions for mankind on the question of homosexuality. If this revelation happens in your lifetime, it might even make you feel good. And you know what? That’ll be OK.